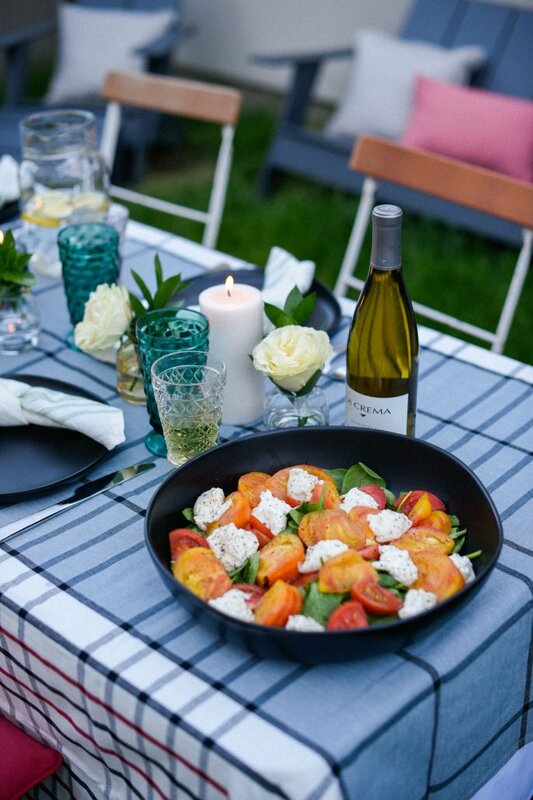 ’tis the season for outdoor entertaining! 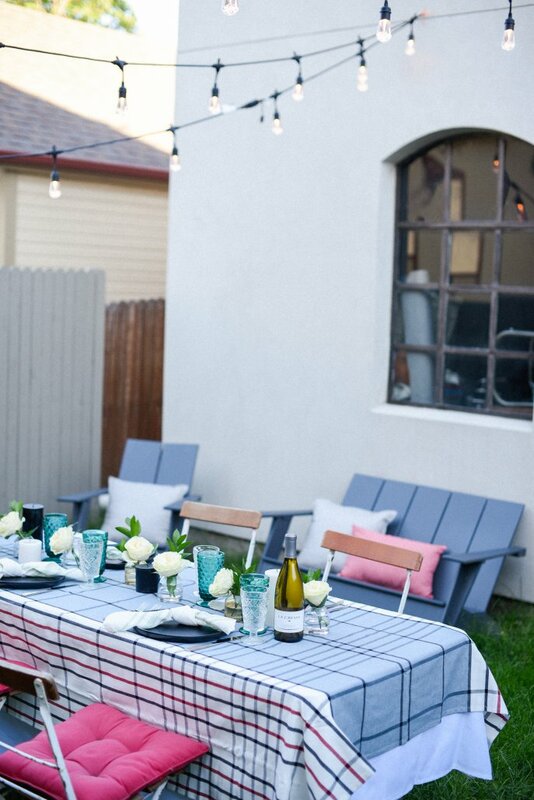 As we officially kick off summer, I am so looking forward to a backyard BBQ every weekend under our charming café lights.It’s the best way to gather friends and family, enjoy the outdoors and grill delicious food! 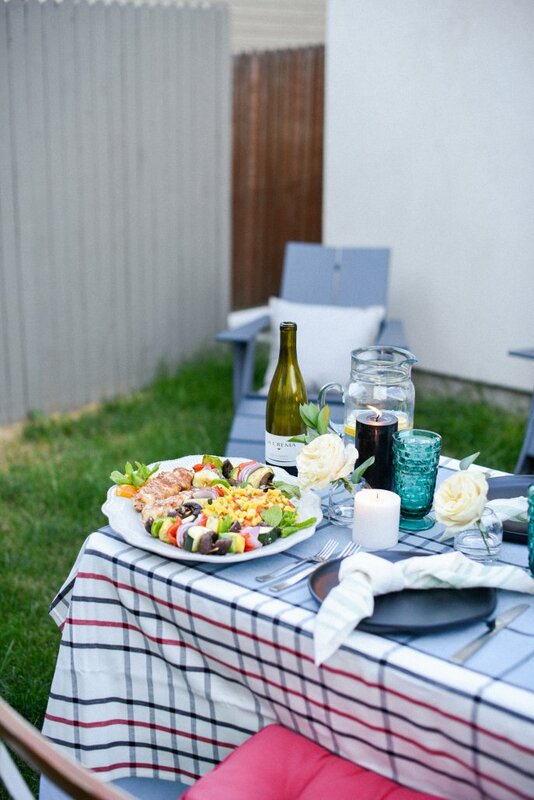 There’s also nothing prettier than dining al fresco while enjoying a warm summer evening. 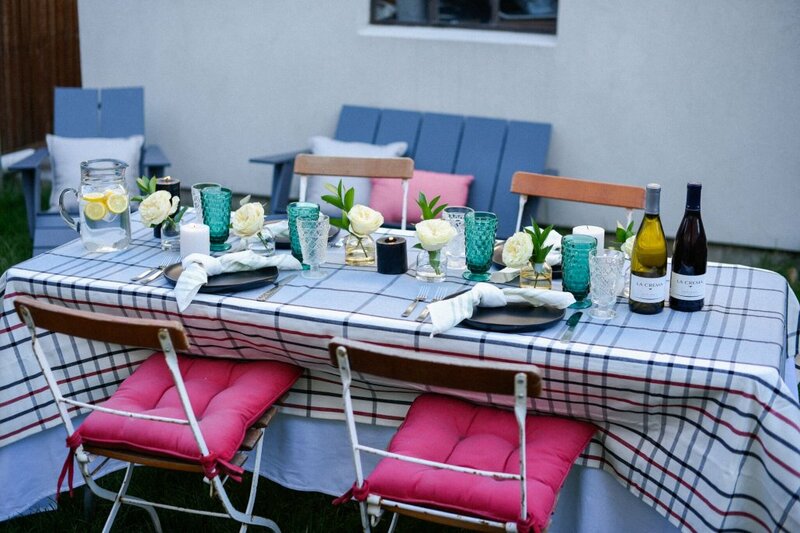 So, I’m here to give you some tips and tricks for hosting a simple and stylish backyard BBQ. 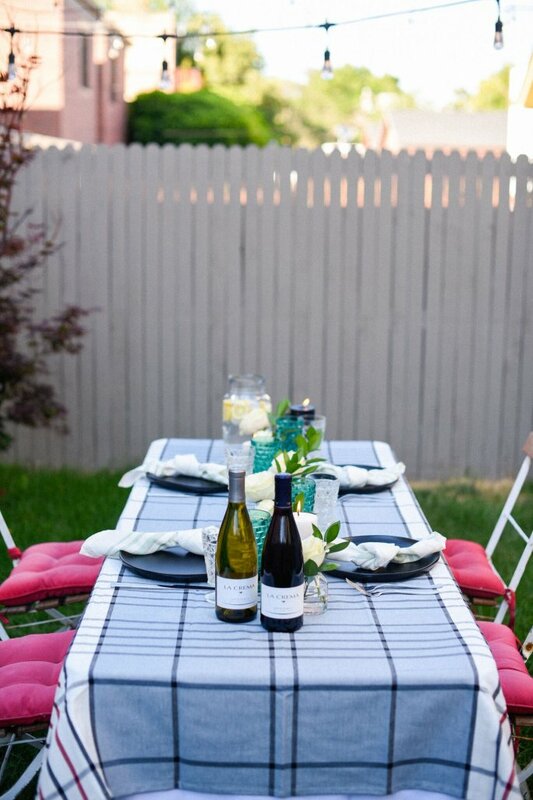 When it comes to setting up your BBQ dinner table, stick to a neutral color pallet. 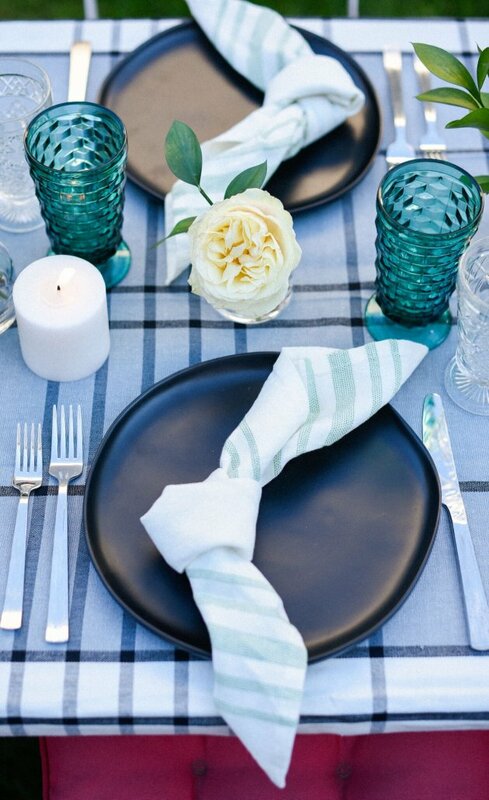 A plaid table cloth paired with black plates and white garden roses along the center on the table give your tablescape a modern yet summery look. 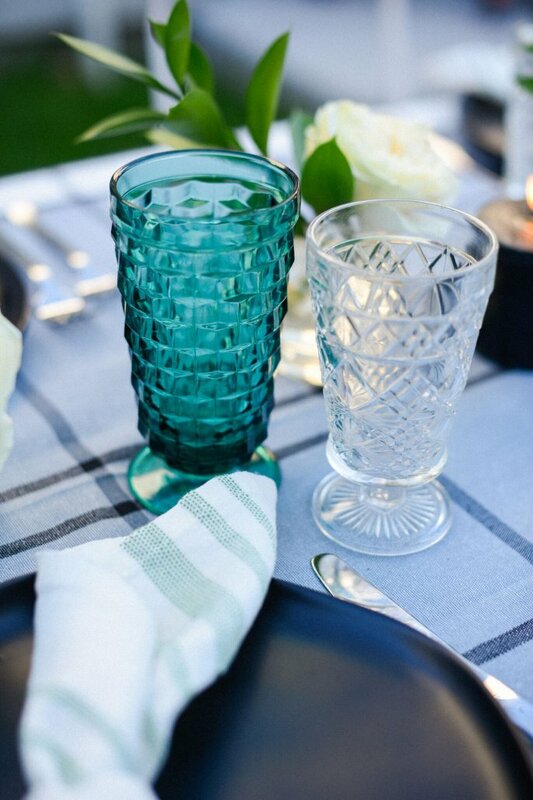 A pop of green in the glassware and napkins give the table a burst of color and ties in the greenery from the centerpieces. If you don’t have a florist on hand, I highly grocery store flowers work just as great (if not better since they’re cheaper). A single bloom, like these garden roses, paired with greenery is a simple yet gorgeous way to create a centerpiece. Add lots of candles throughout the table as well to create a little bit of ambiance. 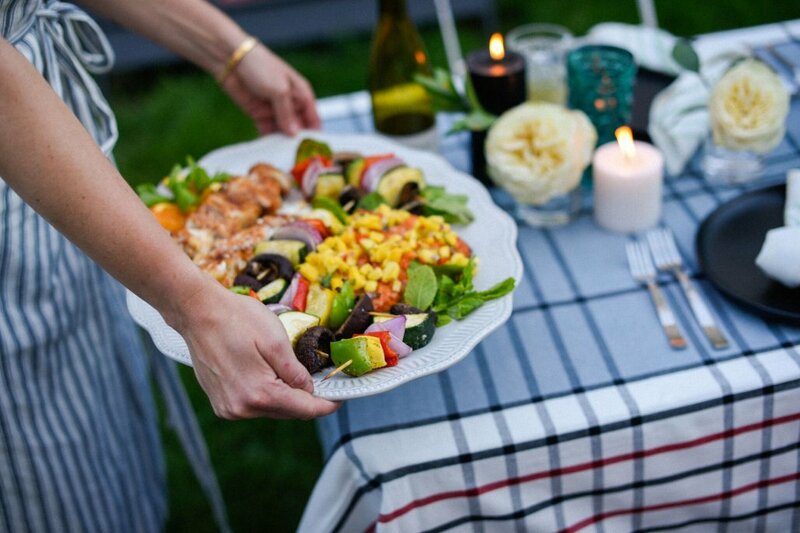 I am always opting for a more healthy option when it comes to summer dinners. 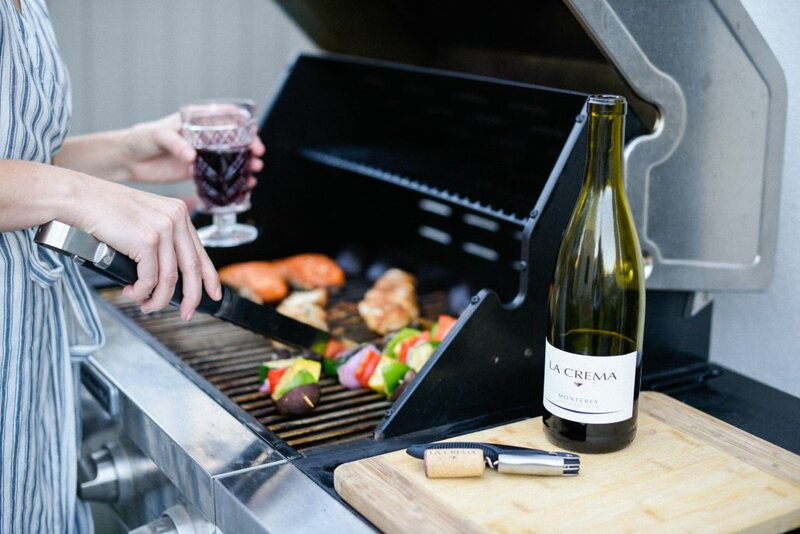 As delicious as hot dogs and hamburgers are, there’s nothing that pairs better in the summer time with La Crema Monterey Pinot Noir and Chardonnay than fresh grilled fish and vegetables paired with an heirloom tomato and burrata salad. Is your mouth watering yet? When it comes to grilling I always put a little kick of spice into what I am making. 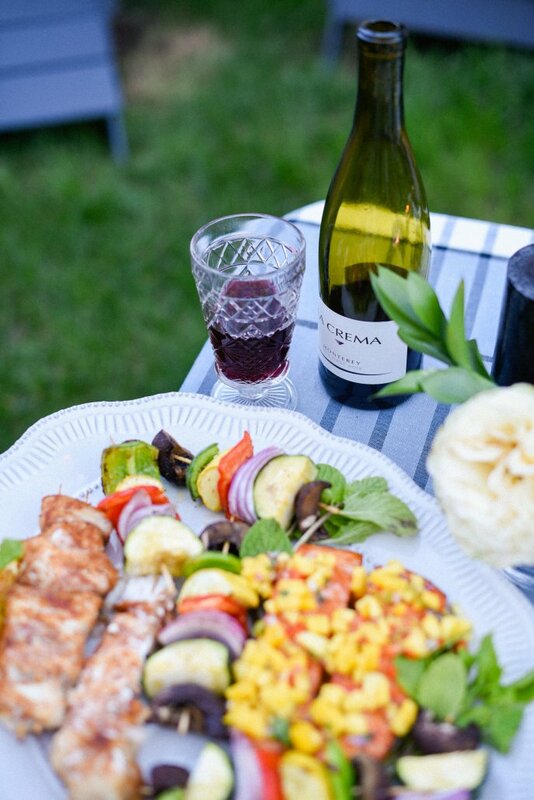 This sriracha salmon is one of my all time favorite recipes to throw on the grill when hosting a backyard bbq! In a small dish mix all the ingredients together. Add more sriracha and more soy sauce if needed! Place the filets in a zip-lock bag and add the sauce. Let marinate for 30 minutes up to 2 hours. In a medium bowl, combine mango, cucumber, lime zest, lime juice, cilantro, onion and jalapeño. Toss to combine. Heat a grill over medium heat. Once your grill is hot, place the filets skin side up for 10 minutes. Flip over for 5 more minutes to let cook. Top with the salsa and enjoy! Another favorite grill recipe are these spiced halibut skewers. 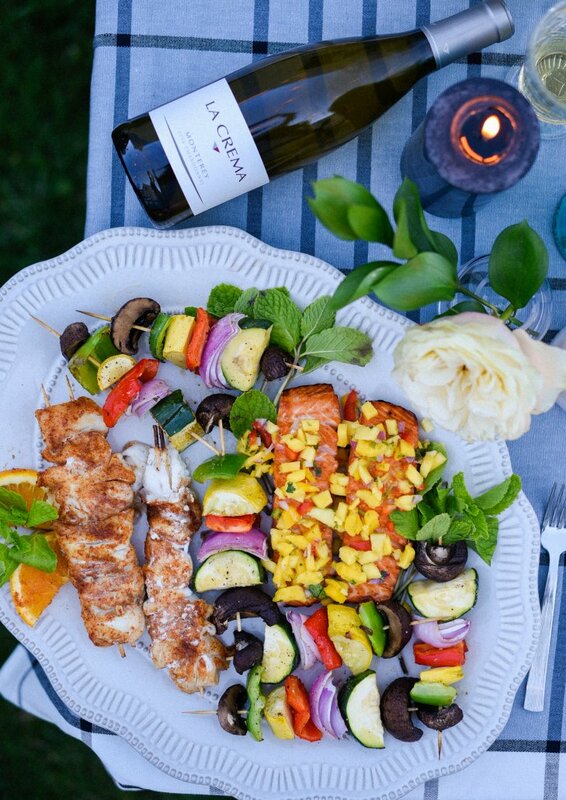 The halibut is chopped and skewered for easy grilling and is packed with so much delicious flavor. 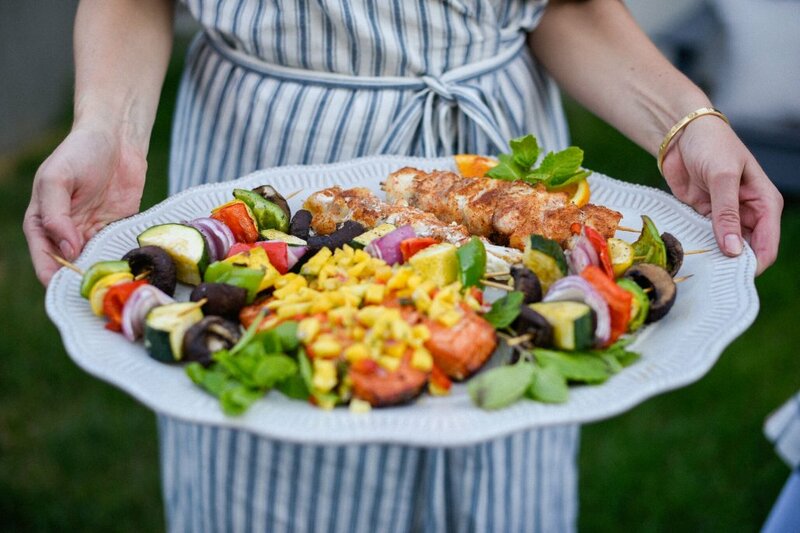 Pair with skewered veggies seasoned with cayenne, salt, pepper and EVOO. Combine spices and salt together in a small bowl. Skewer halibut on double-pronged or 2 parallel skewers, beginning and ending with the halibut. Brush halibut with olive oil and sprinkle both sides with reserved spice mixture. Brush grill with olive oil and grill skewers 2 ½ to 4 minutes on each side, depending on thickness, until fish flakes easily with a fork. Serve with orange slices! 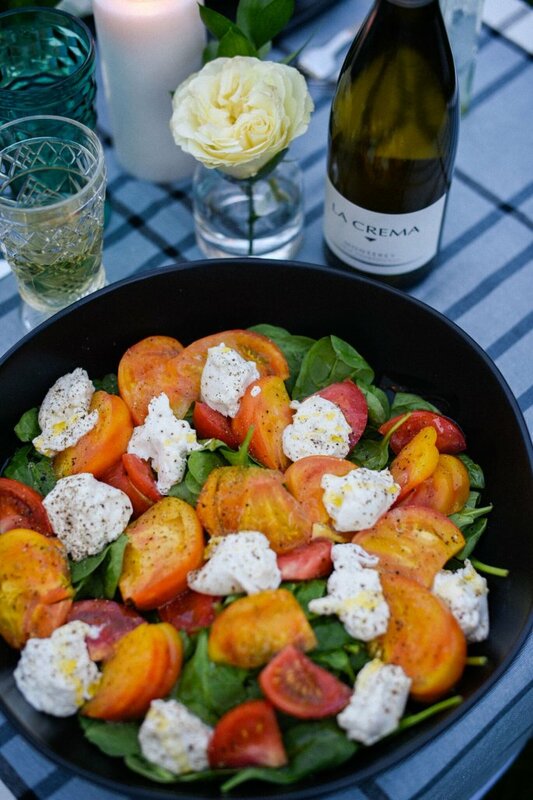 Complete your BBQ meal with a fresh heirloom tomato and burrata salad. Simply fill a bowl with spinach and top with sliced tomatoes and roughly chopped burrata. Drizzle with olive oil and top with salt and freshly ground pepper. 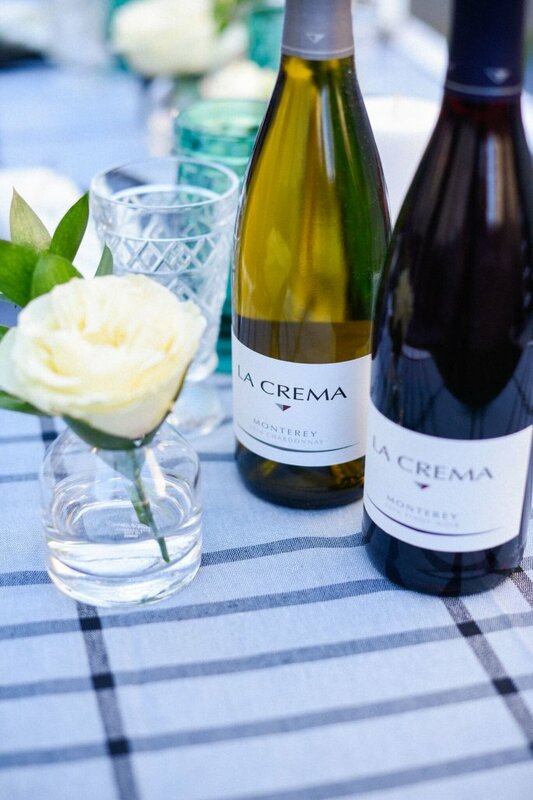 This is the perfect summer salad to serve with any bbq meal, and it’s a wonderful match to La Crema’s Monterey Chardonnay. 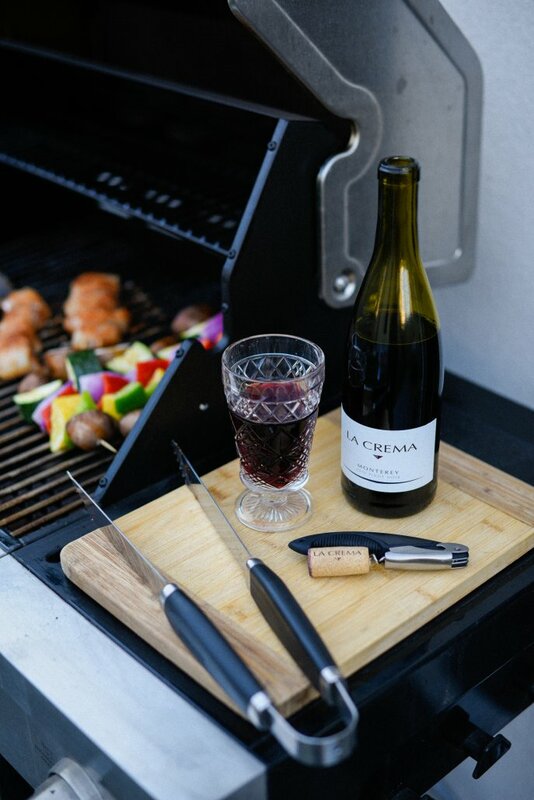 What are your backyard BBQ go-to grilling recipes? Let us know in the comments! Dallas raised but born in Canada, I have lived in Colorado for 7 years. Attending Colorado State University for four years I fell in love with the adventure of this state. I'm is a freelance event planner in Denver Colorado. My blog brings a modern and young look at hosting parties at home for people who have just graduated from college and are living in the real world.